Back in May, the New York Times scored one of their biggest ‘hits’ to date on Trump when they secured 4 memos drafted by James Comey allegedly summarizing direct conversations with the President (we covered it here: Comey’s Revenge: Leaks Memo To NYT Saying Trump Asked Him To End Flynn Investigation). Among other things, the memos asserted that Trump directly asked Comey to end his investigation of Michael Flynn and to pledge “loyalty” to him. Of course, as we all know by now, Comey did not pass his memos directly to the New York Times but instead used an intermediary, Columbia University Law School professor Daniel Richman. Now, Richman told CNN in July that none of the memos he received were marked “classified” but, according to a new letter sent to Deputy Attorney General Rod Rosenstein yesterday by Chuck Grassley, that may not have been entirely accurate. 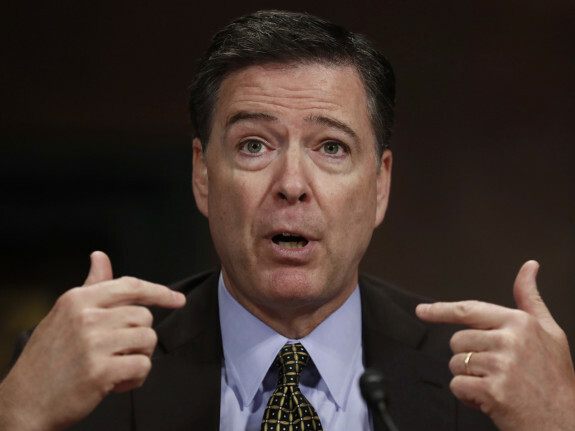 As Grassley notes, 4 of the 7 Comey memos that he reviewed at the FBI were “marked classified at the “SECRET” or “CONFIDENTIAL” levels.” Moreover, since Richman received 4 memos, simple mathematical realities would dictate that at least of them contained material that the FBI now considers classified. My staff has since reviewed these memoranda in a Sensitive Compartmented Information Facility (SCIF) at the FBI, and I reviewed them in a SCIF at the Office of Senate Security. The FBI insisted that these reviews take place in a SCIF because the majority of the memos are classified. Of the seven memos, four are marked classified at the “SECRET” or “CONFIDENTIAL” levels. Only three did not contain classified information. According to CNN, Daniel Richman, with whom Comey shared at least one memo the contents of which Richman shared with New York Times reporter Michael Schmidt, said President Trump was wrong in accusing Comey of sharing classified information with journalists. “My thinking was, if I write it in such a way that I don’t include anything that would trigger a classification, that’ll make it easier for us to discuss, within the FBI and the government, and to — to hold on to it in a way that makes it accessible to us,” Comey told senators. And here, as in the case of Hillary Clinton, is where the problem emerges, because what Comey considered not confidential – just like Clinton – has differed from others’ opinion. In other words, whether he wrote or rewrote the memos to make the leak “easier” – which also begs the question what else was redacted or added to the original content – the confidential information remained…at least in the opinion of someone within the Department of Justice. Of course, as we all know well by now, mishandling classified information and/or making false statements to the FBI is only a crime if you’re a Republican and/or not part of the Deep State. This Committee has previously written to the Department of Justice and the Federal Bureau of Investigation about the memorandum that former Director Comey created purportedly memorializing his interactions with President Trump. My staff has since reviewed these memorandum in a Sensitive Compartmented Information Facility (SCIF) at the FBI, and I reviewed them in a SCIF at the Office of Senate Security. The FBI insisted that these reviews take place in a SCIF because the majority of the memos are classified. Of the seven memos, four are marked classified at the “SECRET” or “CONFIDENTIAL” levels. Only three did not contain classified information. FBI personnel refused to answer factual questions during the document reviews, including questions about the chain of custody of the documents I was reviewing, the date that they were marked classified, and who marked them as classified. When the Committee contacted Professor Richman seeking copies of the memos Mr. Comey had provided him, he refused to provide them, did not say how many he had received from Mr. Comey, and refused to say whether he retained copies. It is unclear whether any of the memos reviewed by the Committee were retrieved from Professor Richman. The Committee has accordingly not determined which of the seven memos Mr. Comey provided him. Professor Richman did tell Committee investigators that he was working with the Special Counsel’s Office, and he reportedly told the media that he had turned over to the FBI copies of the memos he’d received from Mr. Comey. If true, the Justice Department should know which memos were provided and be able to share that information with the Committee. Has the Justice Department or FBI in fact determined that any of the memoranda Mr. Comey sent Professor Richman contained classified information? If so, what steps were taken to retrieve and safeguard the information? Which of the seven memoranda the FBI made available for the Committee’s review did Mr. Comey give to Professor Richman? When did Mr. Comey give Professor Richman the memoranda? At the time that Professor Richman received the memoranda, were any marked as classified? At the time that Professor Richman received the memoranda, did any contain classified information, regardless of markings? Please provide the account information that Mr. Comey and Mr. Richman used. Please describe what steps the FBI has taken to recover all copies of any classified memorandum that might reside on computers, servers, or at other locations. Have you initiated an investigation into the matter of whether Mr. Comey improperly disclosed classified information by providing these memoranda to Professor Richman? If so, what is the status of the investigation? If not, why not? Has there been any review of whether the disclosure of the memoranda by Mr. Comey was otherwise improper, such as whether it violated his employment agreement or any Department rule or policy? If so, what is the status of the review? When did the FBI mark the four memoranda as classified, and who made the classification decision? As noted above, it has been reported that Professor Richman returned the memoranda to the FBI. If so, on what date did this occur? Did anyone from the FBI or Special Counsel’s Office discuss with Professor Richman this Committee’s request for copies of the memos? If so, please provide all records related to any such communications. Does Professor Richman still have possession of any of the memorandum or copies? Thank you for your prompt attention to this matter. Please contact Patrick Davis of my Committee staff at (202) 224-5225 if you have any questions.